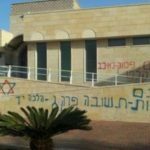 The Reform synagogue in Ra’anana was vandalized last night [LINK] in conjunction with the Western Wall controversy. 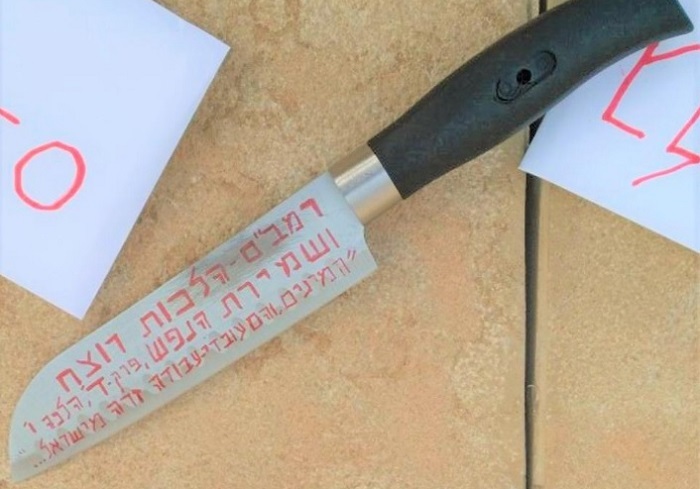 Death threats were conveyed by placing a knife branded with a reference to Maimonides’ Laws of Killing, Chapter 4:10 – “If there is the possibility, one should kill them with a sword in public view. 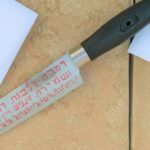 If that is not possible, one should develop a plan so that one can cause their deaths.” Next to the knife were notes bearing the names of the leaders of Reform Judaism in Israel and the USA. 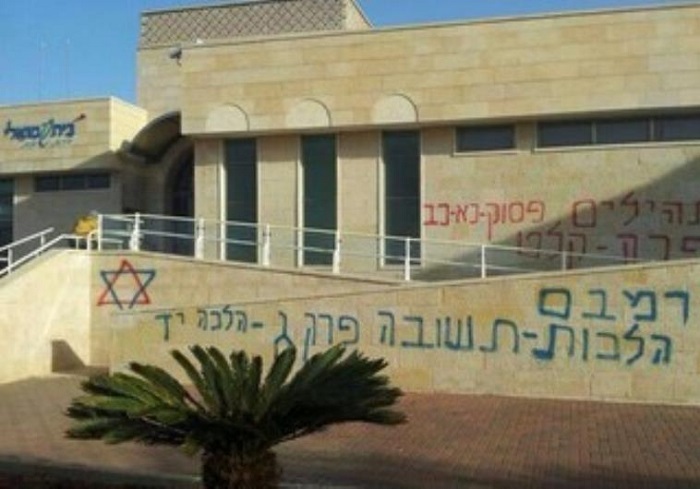 Graffiti was sprayed on the walls, referring to the sanctity of the Kotel, and reference to Obadiah 1:18,1:21, which speaks about burning down the “House of Esau” and re-establishing the Kingdom of God. After the shock and nausea wear off, one might say that good may yet come from this act of violence: 1. This will strengthen the public’s and the police’s understanding that they must exercise a firm hand against these thugs who act in God’s name. 2. Verses quoted out of context are a danger to our society and country, whether they are used by violent goons or rabbis. 3. This is living proof of the shared fate of Diaspora and Israeli Jewry (Rabbi Rick Jacobs, Anat Hoffman, & Rabbi Gilad Kariv were all singled out in the death threats). Together, we ought to change this reality, and bring Israel to actualize its founding vision, which guarantees freedom of religion and equality for all. This week witnessed a new twist in the unfolding Kotel saga. At the initiative of leading Israeli archaeologists that approached a ready and willing Knesset committee chair, a public hearing was held regarding the Kotel agreement from an archaeological perspective [LINK]. Early on, we assessed that the archaeological angle could indeed develop as a significant challenge to the implementation of the Kotel compromise [LINK]. While there is no consensus among archaeologists as to the extent of the potential damage that implementation would cause to this singularly precious historic site, among the opponents one may find some of Israel’s leading archaeologists. They come to the issue without religious malice, but at the same time express a strong rejection of the compromise, based on objective scientific and historical concerns. When such opponents turned to a typical ultra-Orthodox opponent to the compromise who does indeed bear religious malice towards both the Women of the Wall and the Reform and Conservative movements (and happens to chair the Knesset Education Committee [LINK], whose turf includes archaeological matters) there is little wonder that their plea is met with a full court welcome; and the deliberations of the committee result with a public appeal to the Reform and Conservative movements and the Women of the Wall. Two additional interesting elements of the meeting are worth mentioning. While the opposing archaeologists put forth a weighty challenge to the agreement, another senior archaeologist said that he did not share the all-out assault upon the agreement, but rather pointed to the potential to maintain a proper balance between archaeological value and the current needs of worshippers, indicating that the agreement can be regarded as meeting that necessary balance. None of this is surprising, and it indicates that there is yet a turbulent path forward, in which significant circles that come from outside the pluralism debate insistently weigh in, and they play into the hands of those who never wanted to see the site turned over to the Women of the Wall and the non-Orthodox movements. At the same time, given the impediments put in the agreement’s path, this may serve as a basis for giving greater credence to the new front opened by the non-Orthodox movements, reflecting the wishes of the Women of the Wall. Namely, moving the eye of the storm back to the traditional Western Wall plaza, rather than the Robinson’s Arch section.